This is the first book of this series I have read, and as such it will be reviewed on a standalone basis, which although a continuation on the series it can stand on its own. Thanks to Daniel for the review copy. This book is almost inception like in style. There is a book, within a book with multiple apparent writers. The story is well structured and engaging with an interesting plot that keeps you reading and hoping for the best for the characters – and always – feels like it ended far too soon for the reader. I really enjoyed learning about Fullstop Island and what it means to be someone who lives there. Sometimes the punctuation related names would jar me momentarily but once you get into the story you understand more and more why it is like this. The dark and tense themes present throughout add an element of danger that feels real, you are worried for the characters and want to somehow help them. This adds to the reading experience making the pages turn and turn until the book is finished as you are desperate to find out what happens to these characters you are emotionally interested in. Scoop and Fletcher are the main characters and are usually seen as a pair but both have different personalities and fears that will affect the decisions that will be made throughout the book. This makes them diverse and stand out on their own, it is not necessary for them to always be together which is important when you have a pair of characters. They love having a family and a purpose in the world and would do anything to keep is together. There are many side characters that add a depth and have a reason in the plot, they aren’t just in the book to look pretty. Sparks and Alpha may be small but they aren’t to be underestimated and their purpose becomes clear and it can be seen that little girls are not to be over looked! The pirate adds the anti- stereotype that not all pirates are bad and in fact, some have the tools and are willing to help save the world. Grizelda is your wicked witch in the world. She isn’t dumb however she has an agenda and knows exactly how she wants to go about it. Having taken out those who are strong enough to get in her way through the Storyteller she is on a one woman power trip into taking over the island. Her schemes are smart. She is scary and makes a formidable and scary antagonist. Overall this book is really well written and the world building was excellent with a depth and reality evident throughout. 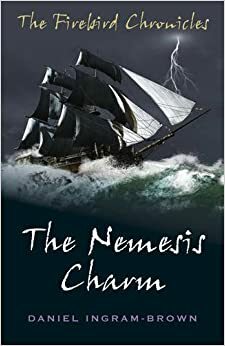 As a reader you could feel the waves and the wind with the characters, with Scoop and Fletcher relate-able and admirable for the reader to associate themselves with. A great and easy read suitable for almost all ages.